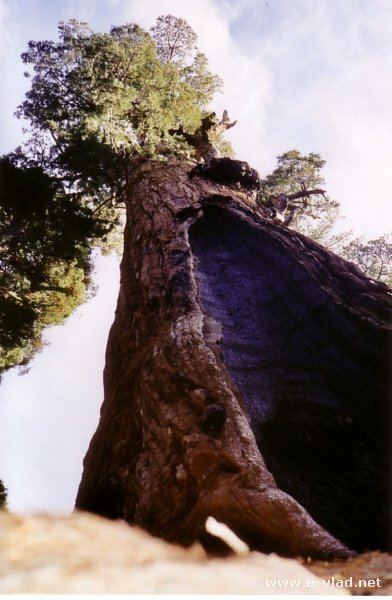 Whenever people talk about Sequoia National Park they mention the Sequoia trees that made the park famous. But Sequoia National Park is home to many other natural attractions. Yes it’s true that the big trees are the main attraction and they will produce awe in everyone looking at them, but when you combine these amazing trees with the spectacular views and incredible hiking trails you get…an amazingly spectacular and incredible place ! That’s Sequoia National Park. Sequoia National Park is a backpackers paradise. Backpacking will take you away from the hordes of tourists that invade this beautiful park and give you first hand experience of the amazing Sequoia trees. Visit the Sequoia National Park visitor center. 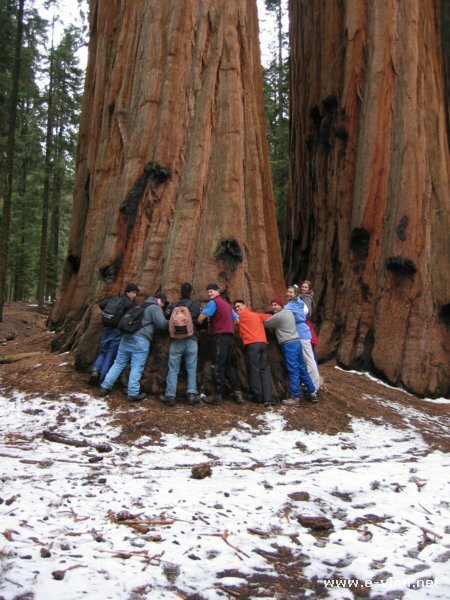 Great place to learn about the Sequoia trees’ habitat and history. In front of the facility you will see one of the larger trees and you will also see it’s contour drawn up with chalk on the ground. This particular tree weighs around 700 tons…as much as a jumbo jet Boeing 777. Hike the High Sierra Trail. 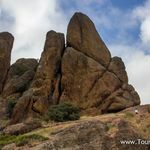 It’s true that you can make it a day trip, but to truly enjoy this trail you would need a couple of nights camping and backpacking. If you do that and you loop back a different way you will walk right through the heart of the Sequoia forest which you don’t normally see if you just drive up to the park. Yes, it’s true ! The Sequoia trees are huge! They’re not the tallest (the Redwood tress are taller) but they are the most massive…they weigh the most. They are also the widest trees and surprisingly they have very shallow roots. That’s why you will see lots of uprooted Sequoia trees. Trying to circle one of the giant Sequoia trees in Sequoia National Park, California. The Sequoia trees are really amazing trees! Sequoia trees are also well insulated against fire. Their bark contains lots of air pockets and it doesn’t burn very easily. This is the main reason why the Sequoia trees are still standing after a forest fire. A Sequoia tree that has survived a real fire in Sequoia National Park, California. Just like getting to Yosemite National Park, you can easily find directions to Sequoia National Park. 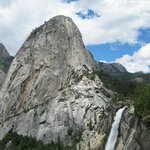 The National Park Services (NPS) maintains websites on all parks including Sequoia National Park (see resources at the end). I love driving to Sequoia and Yosemite…once you get in the mountain areas the drive is just spectacular. Try not to hurry too much, just enjoy the drive and the vistas. You must read the official Sequoia National Park website. During the summer and especially national holidays there can be very long line at the park entrances. Especially around the July 4th holiday, you can wait more than an hour just to enter the park. 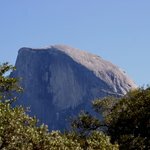 During the summer the road to Moro Rock and Crescent Meadow is closed during the weekend. You must use the free shuttle. 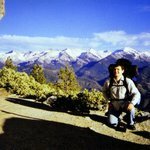 Is it worth visiting Sequoia National Park? Absolutely! Just a spectacular place for everyone! 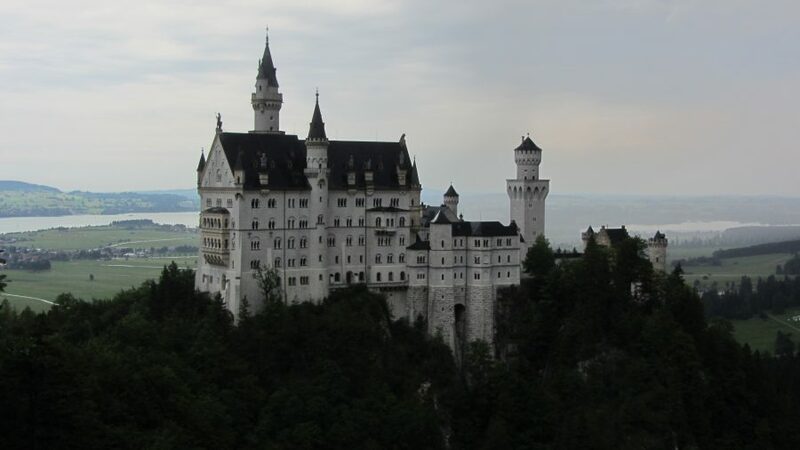 This place has something for everyone…for the avid backpacker and for a family with small children…there are lots of fun things to do.